Geese Theatre Company has been at the forefront of arts-based practice in criminal justice, social welfare and forensic mental health for 30 years. Alongside their work within these setings, the company regularly facilitates training courses on their use of theatre and drama techniques in groupwork settings. The three-day course ‘The Other Side of the Wall’ is an opportunity to learn more about the methodology behind Geese's work. 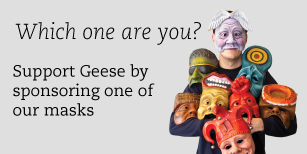 In March 2019 Geese is offering a specialist ‘The Other Side of the Wall’ for staff working in community or secure settings with patients or service users who have mental health issues or personality disorders. However, it is open to anyone who has experience of, or who is interested in working in this field. Participants will be invited to experience and practise a variety of drama-based methods for use in groupwork. This will be underpinned by a clear, theoretical framework and guidance from experienced Geese practitioners. No previous experience of using drama/ theatre techniques is required. For more information or to ask us a question, get in touch: info@geese.co.uk or 0121 449 6222. I really enjoyed this experience and felt that the workers were brilliant. I've taken a lot from this course, as everyone else has too. I'm really proud of myself and everyone else, and very grateful. Thank you.